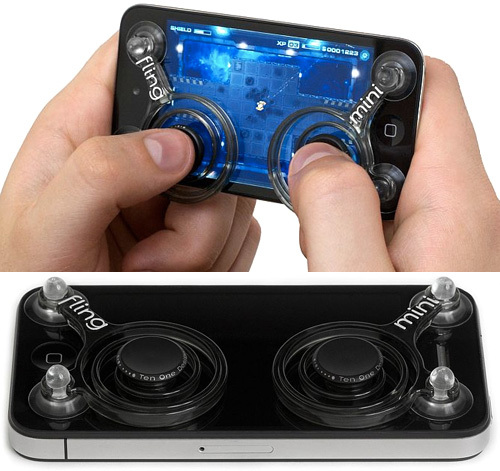 Fling mini Improves Gaming On Your Smartphone | OhGizmo! We reviewed the original Fling a few months ago, and found the stick-on game controller to be more than just a novelty when it came to gaming on a touchscreen tablet device. But since the overall size of the original model would pretty much cover the entire display when used with a smartphone, Ten One Design has finally created a smaller version called the Fling mini designed specifically for compact touchscreen devices. Like the original it uses conductive pads to translate your motions on the joystick to the display below, and a set of suction cups on each controller should securely keep it in place. (With a little dab of spit for extra measure.) Just keep in mind the Fling, and other touchscreen joystick accessories, will really only work with games where the onscreen controls are represented by a virtual joystick. Titles with more advanced touch control mechanisms unfortunately won’t be compatible. A set of two Fling minis is available for pre-order now for $24.95, and they’re expected to ship sometime in mid-July. But you lose almost half the screen to those. Its bad enough that in games like RoboKill (seen in the picture) your character has the bad habit of being under your fingers and not being able to see them. Though the controls are so touchy for that game, it may be worth it to have a tactile button.